Suitable for everyone, these walk-in classes offer practical methods to improve the quality of our lives through meditation and Buddhist teachings. 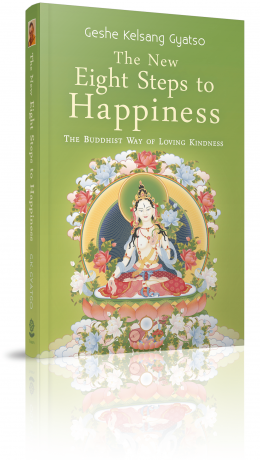 Class topics in February-May 2019 will be derived from this inspiring book, an explanation of the eight verses that comprise one of Buddhism’s best-loved teachings, Eight Verses of Training the Mind. This short poem shows how we can transform all life’s difficulties into valuable spiritual insights. Join these classes to learn practical ways to use this timeless wisdom to find meaning and happiness in busy modern life. April 29 – Who Is Self and Who Is Other? Each class begins with a guided breathing meditation to help settle the mind, let go of distractions and cultivate inner peace. The teacher will then give a practical teaching based on a Buddhist topic, and will explain how we can integrate Buddha’s timeless wisdom into our busy daily lives. The class concludes with a guided meditation to help us become deeply familiar with the teaching. Dedication prayers are chanted at the end of some classes. A: No. Buddha’s teachings are presented in a way that is accessible to everyone, and no religious obligation is required. Q: Do I need to have any experience? A: No. Everyone is welcome, including beginners. The classes are fully guided so all you need to do is show up. A: No special clothing is required, come as you are. Q: Is there any physical exercise involved? A: No. The classes focus on meditation and teachings alone. You can choose to sit on a chair or meditation cushion. Q: Will I be asked to speak in front of a group? A: No, but you can ask questions after class if you would like. A: No, it is not necessary to book in advance. Each class is self-contained so you can come to whichever class suits your schedule and start whenever you like. Q: Why do you charge for classes? A: Kadampa Meditation Center Washington is a registered 501(c)3 non-profit organization run entirely by volunteers. Supporter donations and fees are used to rent or maintain facilities for these classes, and any surplus is donated to the International Temples Project. We make every effort to keep fees low and, for most classes and events, reduced rates are available to senior citizens and full-time students. If you would like to attend an event but are unable to afford the fee, please contact the Administrative Director at least one week in advance. Q: Do I need to wait for the next series of classes to begin? A: No, please feel free to drop in whenever you like. Attending the entire series of classes is highly beneficial, as each class builds on the next. However, each class is taught in such a way that you can derive value from attending even just once.